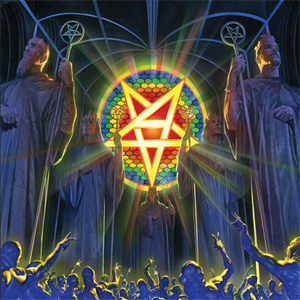 ANTHRAX has revealed the cover art for the band's upcoming release, For All Kings, due out February 26, 2016 (Megaforce). The band's drummer, Charlie Benante, who designed the artwork and worked closely with artist Alex Ross, talks about the concept in a short video that you can watch below. Benante promises that the eleven-song For All Kings will be "aggressive and super-thrashy." The album was written by Benante, bassist Frank Bello and rhythm guitarist Scott Ian, the dynamic triumvirate whose unique composition chemistry is, in part, what sets ANTHRAX's music apart from other bands' in the same genre. Add to that Joey Belladonna's breathtaking vocals and the searing guitar leads by newest member Jonathan Donais, and it's no wonder the band is so excited for fans to hear what will be their 11th studio album. ANTHRAX is currently on tour with SLAYER in Europe and will join up with LAMB OF GOD here in the U.S. starting in January. On these dates, fans will be treated to songs from throughout ANTHRAX's career, including the classics as well as the brand new "Evil Twin", a song that Bello says "is a song that begs to be played live." U.S. tour dates are below.